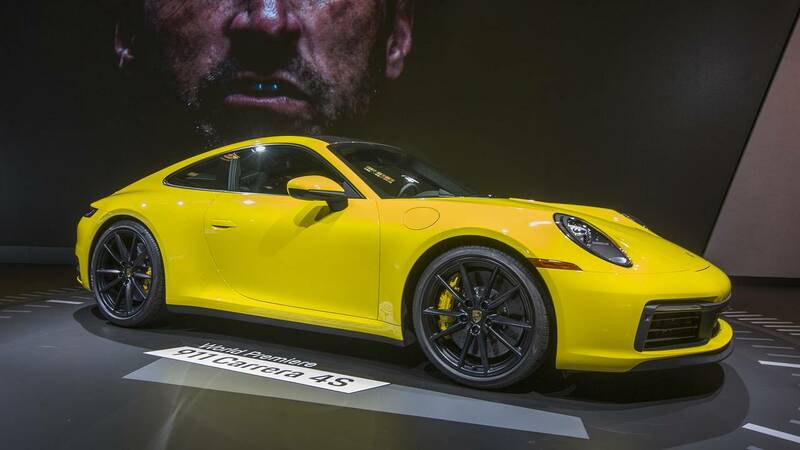 The Porsche 911 Carrera 4S made its world premiere at the auto trade show, AutoMobility LA, at the Los Angeles Convention Center on Nov. 29, 2018, in Los Angeles. (CNN) - Few brands are as purely built around a single product as Porsche is around the 911. All other Porsche models — even high-riding SUVs, by far the best selling Porsches — have body lines suggesting their relationship to the iconic sports car at the heart of the brand. The 911 wasn't the first Porsche. It was introduced in 1963 as a more expensive, higher-performing alternative to the Porsche 356. It was natural to think that, over time, the 911 would be supplanted by other, even better cars. Certainly, many other Porsche sports cars have come and gone in the decades since. But no model ever resonated with drivers quite as well as the 911. Unlike most sports cars, 911s always had a modicum of practicality thanks to small backseats suitable for children. And they've all had their engines mounted far in the back giving them a distinct rearward weight balance. Given its importance to Porsche, and in the universe of cars as a whole, the introduction of a completely new and redesigned 911 is a major event. It's only happened seven times in the past 55 years. This time, for the 2020 Porsche 911, the unveiling was held near Los Angeles. The United States is the largest market in the world for the 911, so it made sense for the German brand to show off its new centerpiece here. The introduction was preceded by a parade of beautifully preserved 911s from prior generations. As expected, when the new 911 finally rolled onto the roadway between two bleachers full of journalists from around the world, it did not look radically different from the others that had just driven past. "What we did, basically, is we cleaned the surfaces and straightened the lines," said Porsche's head of design Michael Mauer. It's a little wider, for one thing, by about 1.7 inches. This new version has big 20-inch diameter wheels in the front and even bigger 21-inch wheels in the back. It's also more powerful, with the 911 Carrera S producing about 443 horsepower compared to 420 in today's version. It will go from zero to 60 miles an hour in about 3.5 seconds, almost a half-second quicker than the current version, according to Porsche. The door handles lay flush against the car's sheet metal, extending when needed, like the handles on a Tesla Model S. One of the most distinctive differences, in terms of the exterior, is the larger, more pronounced air vent in the back over the engine. Nestled among the black slats, a center brake light lights up as two short vertical bars. It also has a lot more technology, including a nearly 11-inch touch screen that replaces some of the switches and knobs in the current generation 911. A new "Wet Mode" relies on sensors inside the wheel wells to detect water on the road. If the road surface is wet, the driver is given the option to turn on "Wet Mode" which will help control the car in those slick conditions. "Night Vision Assist," with a thermal imaging camera, will be available as an option. One thing the new 911 will not have, at least at the outset, is a manual transmission. The 911 will be available initially with a "dual-clutch" eight-speed automatic, with a manual transmission option to be introduced later. The Carrera S is the least expensive version available for ordering right away. Prices for that version start at about $113,000. Standard Carrera models will come later, a Porsche spokesman said. The first new 911 is expected to be delivered in the United States in summer 2019.